Today, we find that the NRC has voted to allow construction of two new Westinghouse AP1000 reactor plants at the V.C. Summer site in South Carolina. There are now two new nuclear energy construction projects underway (Summer, and Vogtle in Georgia) with a total of four ~1000 MWe plants. Read the NRC press release here. Read a statement from Westinghouse (reactor vendor for Summer and Vogtle projects) here. Read the South Carolina Electric & Gas press release here. NuStart Energy has written a press release, and it has been sent to some sources but isn't on NuStart's site yet; click here to check NuStart Energy's press page. APR will link more press releases when they're available. Tonight I'm very pleased to announce the launch of four new recurring features on APR. These features will help the pro-nuclear community, I feel, in a big way. One of the largest problems we (as pro-nuclear authors) face is the fact that we essentially have not been allowed a history. If someone gets interested in a Chevrolet, that whole history is available. Similarly if someone gets interested in Boeing. Or Singer sewing machines. Or the history of steel making. Or the history of railroads. Or the history of seafaring, from sail to steam. I can go on. Our fundamental problem is a lack of backstory. This omission of things nuclear from wide print for thirty to forty years is probably mostly the fault of the same "pro-environment" crowd that passed the NEPA, forced the dissolution of the AEC, and the dissolution of the JCAE. Prior to that time nuclear power technology wasn't quite front and center in America's press, but it wasn't left out or, worse, left to anti-nuclear hack writers either. Some of you already know that I have the material and the knowledge to fill much of this historical gap, and this new project is the real launch of my attempt to do just that. Four different topical features will be presented, fairly regularly (probably every other week) which will both tell the history of nuclear technology and give a real sense of how things were back when nuclear energy was new and in development. Let's just briefly mention and describe these four topically oriented features. Thanks both to my collection of material, and to the acquisition of a large collection of papers from the late Jim Vadeboncoeur, much of the inside story of the development of the nuclear business can now be told - from an inside perspective in many cases. Much of this material focuses on the biggest early Westinghouse commercial project, the Shippingport Atomic Power Station. Not only do I have detailed PWR (Shippingport) technical and operating information, but I also have a complete press release package (hundreds of pages) as well as a great deal of the late Vadeboncoeur's inside information about setting up and managing the fuel fabrication business as Westinghouse. 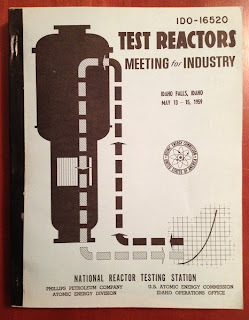 This long out of print, long abandoned and long forgotten program was actually a study at home introduction to Nuclear Engineering... but one that dates from the early years (about 1962) of commercial nuclear energy. We'll look through the nearly complete set of study manuals and examine how nuclear power 'worked' in many ways back then. Sure to be an amusing comparison to today's equipment and methods. And, by the way, I actually did get some training in vacuum tube equipment during my nuclear education, so I know more of what's in these volumes than you might think! 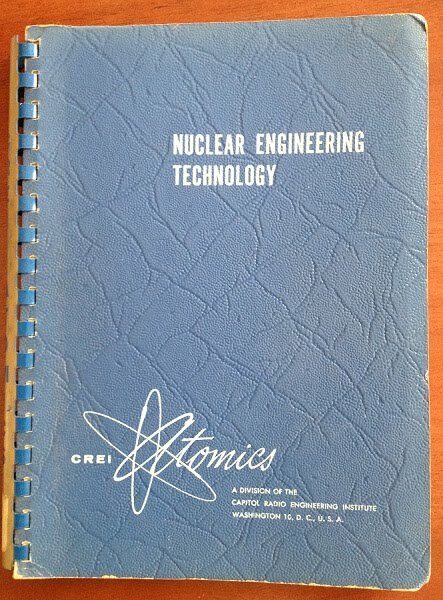 Below, the cover of one of the set and its great "CREI Atomics" logo. The late Jim Vadeboncoeur, whose massive collection of original papers is now in my hands, left Westinghouse to work for Sylvania-Corning Nuclear during the critical period when many reactor projects, whether training reactors, test reactors, or power reactors, were being made and then cancelled so fast it was hard for anyone to keep up - much less construct a workable business manufacturing and selling fuel. Sylvania-Corning was right in the mix of it, and large amounts of technical data from this company help tell the story of what it felt was 'right' for general sales - and tell how the company was very wrong. 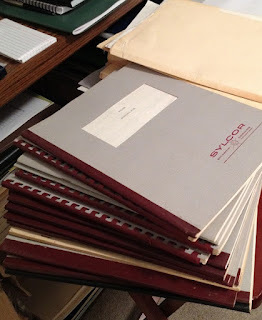 Further, Jim moved out to open a Western sales office when Syl-Cor (as the company's name is normally abbreviated) really tried to go big time and the story of that brief interlude is a fascinating inside story of the fuel fabrication end of nuclear energy in the early days. Below, a pile of Syl-Cor technical manuals along with a pile of Vadeboncoeur's business records, corporate correspondence, and other varied documents. A large pile of information exists containing widely scattered topics on early nuclear energy. 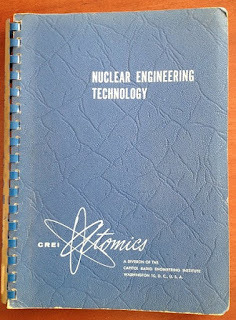 Both materials from my collection and from Vadeboncoeur's papers will tell brief, spot stories of some of the early nuclear projects, whether they be test or training reactors, power reactors, or even other topics not reactor related but nuclear related nonetheless. Below, the cover of just one of many, many interesting volumes we'll explore under this topical heading. So, as you can see, there will be a lot of historical information appearing at Atomic Power Review from now on.. not that it hasn't already! My campaign to discuss the technology of nuclear energy, and the history of that technology, now has a better framework than ever to get much of this information I'm seeing every day out to those who would like to become familiar with it. This is a test post only. Blogger has decided to launch a new control panel; this appears to be right in line with Google's attempt to destroy everything it has contact with or owns on the internet- including YouTube. This post is simply a test to see how the new Dashboard controls work and whether the posts appear in the original format of the blog properly. The photo is Peach Bottom 1 for those who don't recognize it. -Tubes in the steam generators are vibrating. -The vibration is causing rubbing against support and alignment structures for the tubes, and rubbing against adjacent tubes. One might wonder whether the vibration is caused by water and steam flow on the secondary side (steam side) of the U-tubes, or if it is caused by flow not within desired parameters on the primary side (inside) or both. Clearly the exact cause is not known as I write this. What's clear is that all the appropriate actions for S/G tube leaks have been taken up until this point, and that proper investigation continues. There is nothing particularly alarming or disturbing in the NRC's report. As I have mentioned before, steam generators have thousands of tubes (these have 9727 each) so that there is always substantial reserve to have tubes plugged - and many steam generators are in full, safe, daily operation with hundreds of tubes having been plugged over their lifetimes. Permit a clumsy historical semi-analogy here. Many tens of thousands of steam locomotives used to travel the world's railways - and these often experienced leaking flue tubes. These were often hand rolled in place or else power rolled in the shop to stop leakage... but since locomotive boilers aren't that large, the flues aren't that large or heavy, and since the locomotive boilers weren't contaminated, and weren't inside a massive containment structure, replacement of flues was always done. With nuclear plant steam generators, there is no other option -- and never has been -- other than to permanently plug the U-tubes in place if they leak. This set of facts is not a surprise whatsoever, and excess capacity has been designed into plants from the very beginning. Some media outlets are carrying interviews or pieces that make this issue sound catastrophically dangerous. I can assure you that it is not. What is more important is the allegation now being floated that massive U-tube rupture is possible, leading to a possible meltdown. Would the designers of these plants, knowing the possibility (since the beginning, in the early 1950's, that is) of primary to secondary leakage NOT prepare for rupture of the tubes? The answer is yes ... but frankly, the also designed for fast primary coolant leak would lead to a loss of coolant far in excess, in terms of rate, than you'd see with even a major primary to secondary leak.. and that loss of coolant rate is also designed for by emergency makeup systems which can flood coolant (borated, in most plants) into the primary to keep the core covered and cooled. So, then, "experts" saying that the potential for primary to secondary leaks that can lead to meltdown on this plant are not telling the truth. To be fair, primary to secondary leakage is a problem. It's one of the problems you expect you might have to deal with in a pressurized water plant. That's why detectors on the condenser air ejector vents are there in the first place! That's also why they alarm at a detected level far below that which would correspond to a serious primary to secondary leak. Further, monitoring of primary coolant inventory isn't that hard - compensated pressurizer level is a good clue. The point here is that you know if you're losing primary coolant to the secondary pretty quickly after it starts -- even with a small leak. Closing for now, I'd like to point out that the NRC is clearly confident that the owner operator (Southern California Edison) is on top of the plan to make sure the plant is safe before restart. The communication between the NRC and SoCal Ed is clear, concise, accurate and realistic. The plan to make sure the causes of the U-tube vibrations are known and corrected before restart is clearly in progress. Knowing these things we can all be assured more now than ever that the real fundamental causes of this difficulty will be found and corrected prior to San Onofre 2 and 3 being restarted. Labels: "primary to secondary leak", "san onofre", "steam generator"
The 97th Carnival of Nuclear Bloggers is up very early this Sunday morning at Brian Wang's site "Next Big Future." This weekly feature showcases the best that the pro-nuclear blogging community has to offer .. and this week's Carnival is a pretty big one. Of perhaps special interest this time to dedicated APR readers is a double cross-linked set of stories on both APR and on Dan Yurman's "Idaho Samizdat" covering pretty much the same issue but from entirely different perspectives. You'll see. I encourage you to get over and check out the Carnival before starting on that lawn, planting those flowers, or hitting the driving range today. Nuclear power is "a costly and highly dangerous option for generating electricity, and its contribution to reducing global warming is minimal," Greenpeace said. Here is a link to this Fox News report. Greenpeace, this is to you: Really? -Commercial nuclear energy in the US has had one nuclear accident in its history since 1957 and no one died there. Over 33,000 people are killed each year in the United States in car or car related deaths; how could nuclear be any safer than it is? -Nuclear energy produces no greenhouse gases. Environmental heating by process waste heat is no different than that produced by coal or oil fired steam plants. As such, nuclear energy with zero carbon emission is a major contributor to the fight against global warming since it provides continuous, solid base load power. Wind farms have to be backed up by massive fossil fuel powered installations for times such as when the wind doesn't blow. Solar farms have to be backed up by fossil fuel powered capacity for such times as when it's too dark to get good voltage. Only nuclear runs around the clock, wind or no wind, sun or no sun producing no carbon emissions and requiring no carbon polluting backup for those times when the weather or the day-night cycle don't cooperate. We can see then that this single quote by Greenpeace really does reveal that they know nothing about the generation of power, nor the utility or efficacy of nuclear energy. If this is the best convincing there is, Mexico will have two new nuclear generating stations underway in the not too distant future. Click here to see a great CFE (Comision Federal de Electricidad) presentation on Laguna Verde. But brush up on your Spanish first! Now, what makes this story a bit more frustrating for all involved is the fact that all of the steam generators we're talking about here are brand new. These steam generators are Mitsubishi built replacements for the originals, built by Combustion Engineering, which are no longer available. This author has made some requests in the industry to find out some specific details on the replacement generators but so far these have not come back. Click here for an SCE release on MarketWatch. Now, the NRC blog post gave perhaps the briefest possible explanation of what a steam generator is. We can do better than that here at APR - and we will. Let's first, right off the bat, mention that there have historically been three manufacturers in this country of large, commercial, pressurized water reactor plants; Westinghouse was first, followed by Combustion Engineering and by Babcock & Wilcox. Each had its own design theories on everything; comparing two of the plants is like comparing a 1970 Camaro to a 1970 Mustang. Let's take a look, then, at some general characteristics of steam generators - we'll look at operative features and the differences between the original equipment built and installed by the vendors. For this portion, we'll use Westinghouse steam generators. 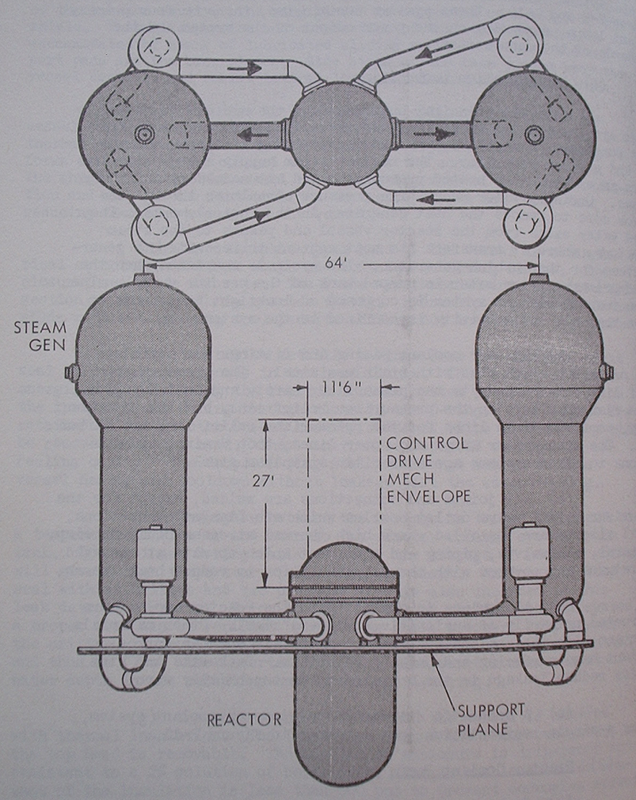 Below, our first illustration which is very basic and which depicts major parts of a Westinghouse steam generator. 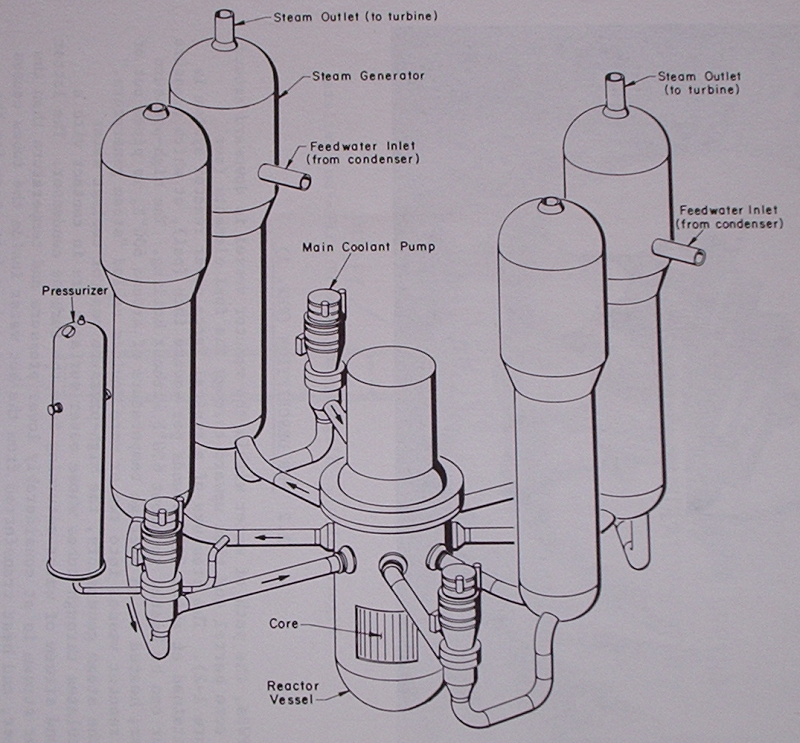 The function of the steam generator is to transfer heat from the primary system (which is water that goes through the reactor core) into water in the secondary system (water that is turned into steam, used to perform work, condensed, and returned to the steam generator, never mixing with reactor water.) So then we need a piping system inside the steam generator to carry the primary water - which is at very high pressure and temperature - and efficiently transfer heat to the secondary water. This is best done with many thousands of small tubes, made of a special material (Inconel 600, very often) that will not corrode in this type of environment. 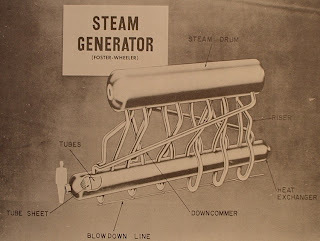 As we see in the drawing above, thousands of tubes form the "tube bundle" so clearly visible taking up most of the volume of the lower 2/3 of the inside of the steam generator. These tubes are all mounted into a thick, heavy tube sheet (sometimes called a tube plate) and, as we can see, the area below these is divided in half. Hot primary water enters the inlet plenum, then goes through the tubes transferring energy to the secondary water outside the tubes; it then exits the tubes into the outlet plenum, and then goes on to the cold leg of the primary system. Since the primary tubes are shaped kind of like an upside down letter "U" they are widely just called "U tubes." Now, before we get too far, it's important to note that the temperature difference between the water going in and the water coming out of the steam generator on the primary side isn't as high as most people think. Generally, pressurized water reactors have a differential temperature, at full power, between the water going into the steam generator and the water coming out well under 100 degrees. For example, the "hot leg" temperature at Shippingport Atomic Power Station, the first commercial US pressurized water plant, was 537F while the "cold leg" temperature was 509F, for a difference of just 28 degrees. However, the plant was moving about 7,350,000 lbs of water per hour through each of three operating loops; so, we can begin to understand that while the temperature change of the water was not that great, the total energy transferred WAS because of the massive amount of water being moved. In later plants of course the temperature difference gets wider and the amount of water being moved becomes truly massive. By the mid 1980's the Westinghouse Model 412 design (4 loop, 12 foot core height, 3411 MWt core power) was being advertised as having a hot leg temperature of about 619F, cold leg temperature of about 558F for a difference of 61 degrees. This plant design had four loops, each of which had a seven thousand horsepower electric motor-driven pump moving about 34,600,000 lbs of water per hour. Now that we've had an idea of what's going on inside the primary side of the steam generator, let's take a look at the really complicated portion - which is the secondary side. This area of the steam generator has to admit feedwater from the feed and condensate system, allow for heatup and mixing of the incoming feedwater (so as not to thermally shock the U-tubes), provide for an area to allow water to rise up through and boil in the tubes, separate out the water droplets from the steam (and return the water to the steam generator while allowing only steam to exit), provide for blowdown (letting out steam or water for cleaning), allow for measurement of water level in the steam generator, allow for sampling of water (to control chemistry to prevent corrosion), and some other things. It's a massive, complicated piece of equipment! 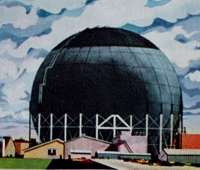 Let's look at a really detailed illustration which comes from a visitor's center brochure covering Connecticut Yankee - an old Westinghouse PWR plant. As with all illustrations here, click to enlarge. On the right side of this illustration we see the feedwater inlet; this supplies a ring that runs around the steam generator, spraying the water downward into the downcomer region that is outside of the tube bundle, but surrounds it completely. As the feedwater goes down, it both mixes with the water raining from the steam separators (more on those in a moment) and heats up. At the bottom, it makes the turn and moves up into the tube bundle area where it is heated to the boiling point; it blasts upward toward the top of the tube bundle. (Follow the arrows.) The steam, laden with water droplets carried along, enters a set of cyclonic or swirl type moisture separators that force the mixture to swirl rapidly; the steam can make the turns, but the water cannot and is thrown off and rains back down into the downcomer area. 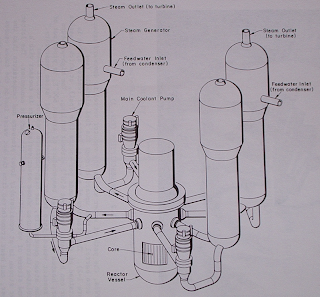 After this, a second set of moisture separators is encountered in this design which is labeled as the "mist extractor assembly" at the very center top of the steam generator. Again, steam is allowed to continue on to the outlet to the steam system, while water returns to the downcomer region. All this water returning isn't just a gentle rain - it's a rainforest gully-washer of Biblical proportions. Well, anyway, it's a lot of water. Many other design features are also shown. Let's now take a brief look at some of the basic differences between the Westinghouse, Combustion Engineering, and Babcock & Wilcox steam generator designs and plant layouts. Again -- this is a basic introduction. WESTINGHOUSE: In general, Westinghouse plants have either two, three or four steam generators depending on how powerful the plant is. Each steam generator has its own specific hot leg, cold leg and reactor coolant pump. Below is a general basic view of a Westinghouse four-loop plant (as was described second above when we were talking about temperature differences and flow rates.) The steam generators, internally, are quite like those already shown. 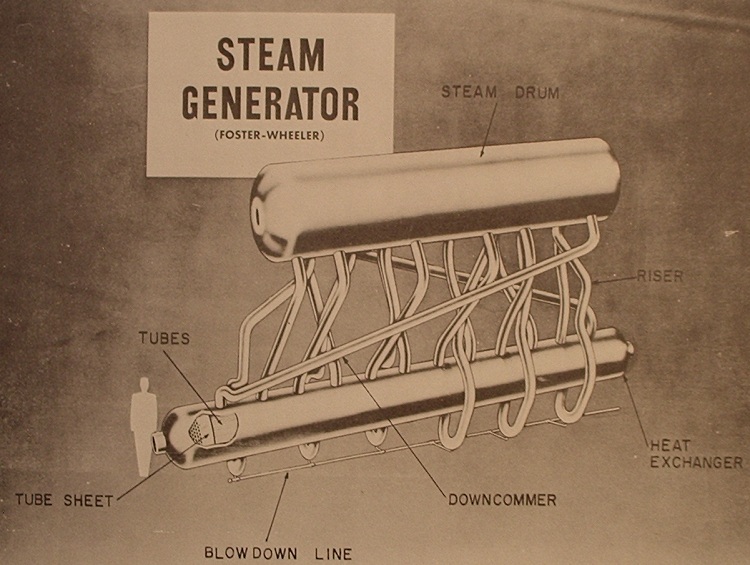 Below, a typical Westinghouse steam generator as depicted in WASH-1082. COMBUSTION ENGINEERING: CE plants always have two steam generators, no matter how powerful the plant is. Here is a view from WASH-1082 of a typical Combustion Engineering reactor plant. Note that while there are only two steam generators, and two hot legs, there are two cold legs and two pumps for each steam generator. Below, from a Combustion Engineering - Consumers Power specification brochure covering Palisades is a view of one of that plant's steam generators. 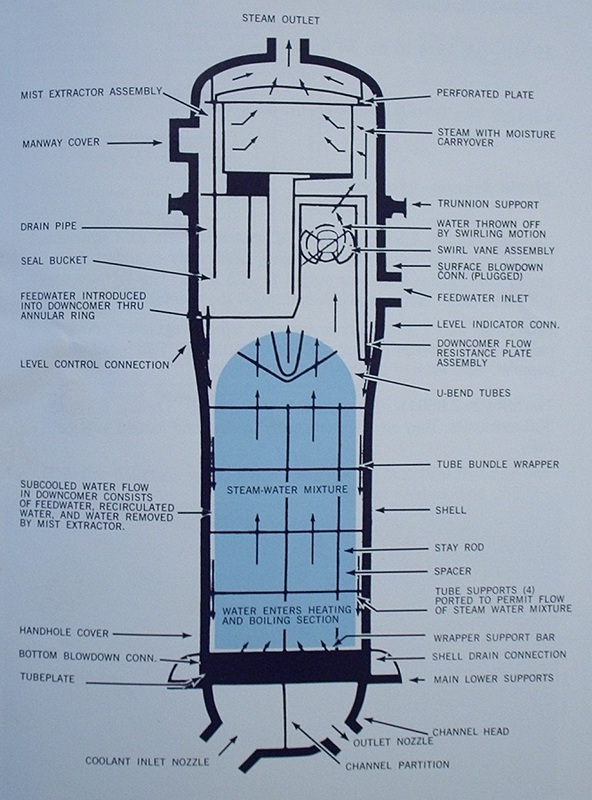 Below, from WASH-1082 is a slightly more detailed illustration of a typical CE steam generator. BABCOCK & WILCOX: These are the most unusual steam generators. These steam generators do not use U-tubes; instead, they use straight tubes - and the primary coolant passes vertically down through the steam generator in these tubes, from the top to the bottom. These steam generators are very tall - and the run of primary coolant pipe that forms the hot legs is enormous. 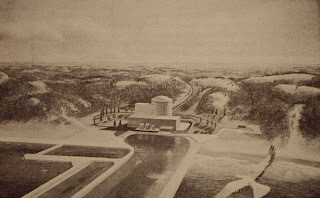 Below, a general perspective of a Babcock & Wilcox reactor plant. Below, the "Raised Loop" configuration of the very late Babcock & Wilcox plant design. 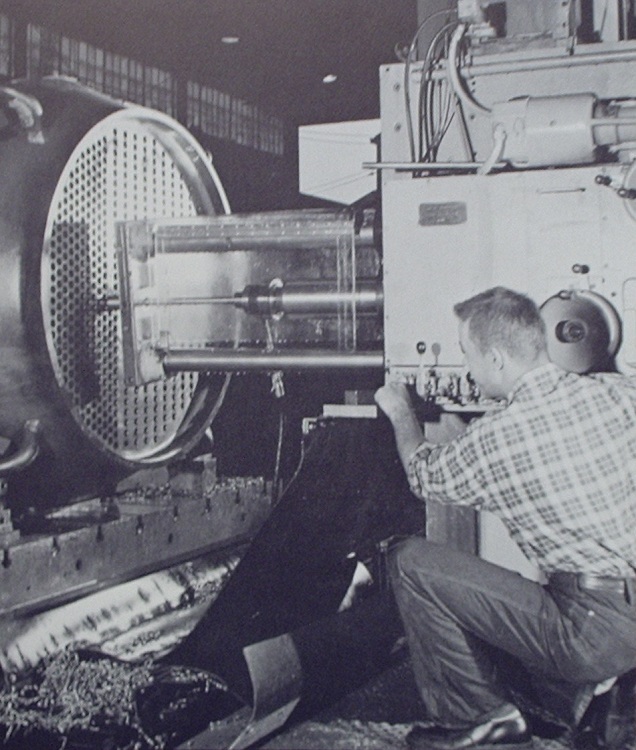 These single-pass steam generators do not have anywhere near the amount of water on the secondary side at all times that Westinghouse or Combustion Engineering steam generators do; according to "The Second Nuclear Era," Combustion Engineering steam generators have a secondary water inventory five times that of the B&W steam generators. This makes the pressurized water plants with U-tube type steam generators less rapidly responsive to secondary side transients .. such as loss of feed, or overfeed after scram .. since there's more secondary water to absorb transients caused by rapidly changing temperature of feedwater. On the other hand, though, the single-pass steam generators are much more efficient and actually allow a tiny degree of steam superheating -- there is no superheat to the output steam at all on U-tube type steam generators. Superheats of between 30 and 60 degrees are achievable with vertical, single pass steam generators; while this does not allow the use of "dry steam" turbines without multiple stages of separation and reheat, it does drive up overall plant efficiency. As you have probably already guessed from looking at the illustrations which include dimensions, steam generators are exceedingly large and heavy components. They are also difficult, time consuming and exceedingly expensive to manufacture. 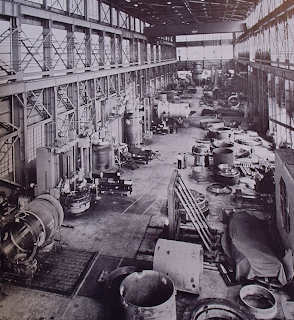 The three major reactor vendors who offered pressurized water reactor plants all manufactured their own steam generators (except for the earliest Westinghouse plants.) 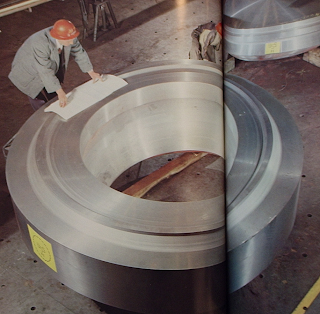 A generic description of a 250 MWe steam generator in "The Nuclear Industry, 1969" (USAEC) gives rough dimensions of 68 feet in height, 14 feet in diameter and a weight of 330 tons. Westinghouse, in the middle 1980's, specified its Type F steam generator as weighing 346 tons dry, 422 tons normal operating weight and 560 tons flooded full. This steam generator could produce 3,813,000 lbs/hr of steam at between 920 psia and 1000 psia. Because of the complexity and mass of this piece of equipment, it had to be one of the earliest ordered during the construction process for a plant. According to WASH-1174-71 ("The Nuclear Industry, 1971") the time that steam generators had to be ordered from the manufacturing facility was slightly over four and a half years before the expected criticality date. 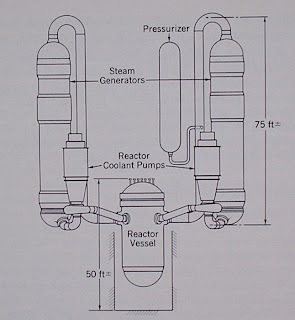 (Only the reactor vessel, turbine generator, and condenser & auxiliaries had to be ordered earlier.) This same volume mentions that in 1971 the three companies manufacturing steam generators (Westinghouse, with facilities at Tampa, Florida and Lester, Pennsylvania; Combustion Engineering, with plant at Chattanooga, Tennessee, and Babcock & Wilcox, with plant at Barberton, Ohio) could together supply about 60 steam generators total among them per year which at that time was enough to supply the expected build rate for the next ten years. It suffices to say that the worst thing that can happen in a steam generator is for the U-tubes to leak or rupture, allowing primary coolant to get into the secondary side water and steam. This is called a primary to secondary leak, and is the reason we're talking about San Onofre at all. I should mention that very tiny leaks are detectable - they're then found by hydrostatic testing when the plant is shut down, and the normal practice is to plug the tubes. Steam generators are always built with so many tubes that even plugging a hundred of them won't affect the steam generator's ability to provide the rated amount of power. There are a few ways to get U-tubes to leak. Poor chemistry control on the secondary side can lead to corrosion, and leakage. Poor design can cause crushing of the tubes under flow impingement. Poor fabrication and manufacturing can lead to leaks in anything man ever made - and this could be true for steam generators as well. I could go on, but it's important to note here that SCE does not yet know why there are tube leaks on the San Onofre generators and we'll just have to wait for their report or something more from the NRC before we can make any kind of judgement call. In Depth: Dan Yurman at IDAHO SAMIZDAT wraps up the entire situation at San Onofre. 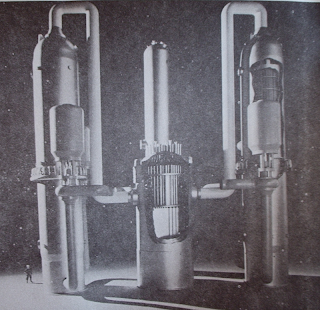 The first commercial pressurized water reactor plant that had unitized, vertical, U-tube steam generators was Yankee Rowe (Yankee Atomic Electric Company.) That plant went on line in 1960. 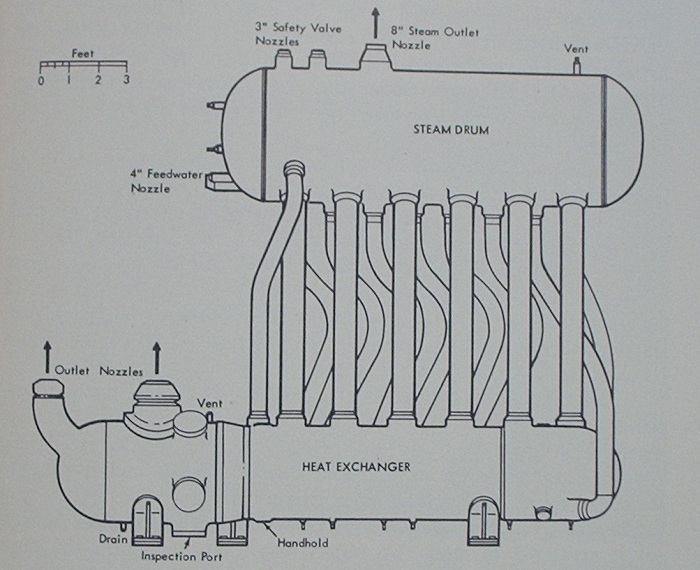 Prior to that, steam generators in commercial plants had separate heat exchangers and steam drums. Let's take a look at some of these. These two illustrations are from the complete Shippingport Atomic Power Station press package in the APRA collection. Note the many spidery pipes that are used to pipe steam/water mixture up to the drum or separator section, and the many downcomer pipes used to bring returned saturated water down from the drum to the heat exchanger. The Foster-Wheeler design used straight, once-through or single pass design on the primary side with straight tubes and straight shell. 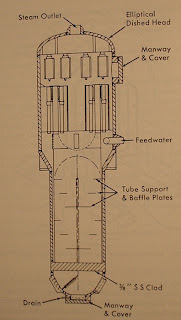 The Babcock & Wilcox design was also single pass, but the whole heat exchanger portion was bent into a "U" so that both the tubes and the shell were "U" shaped. The different designs were fabricated this way to allow investigation of the relative merits of the two designs. Below, one of the lower heat exchanger sections being removed from Foster-Wheeler Corporation's plant at Mountaintop, Pennsylvania. 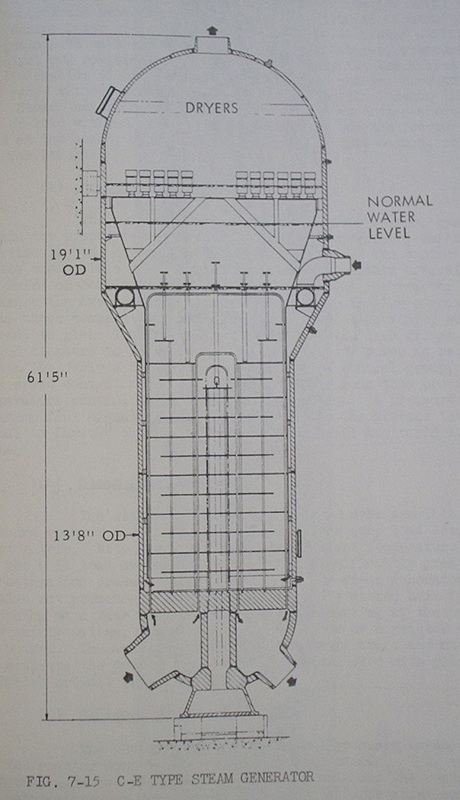 Babcock & Wilcox used the same general design that they supplied for Shippingport in their own Indian Point 1 and NS Savannah plant designs before changing over to the once through design. 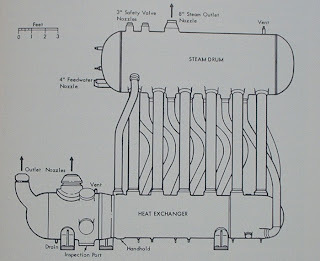 Below is an illustration of one of the Savannah's two steam generators. The illustration below is from the US AEC's photographic essay for the 1958 Geneva conferences entitled "Atoms for Peace / USA 1958" and shows what is described as a heat exchanger for Indian Point being drilled. 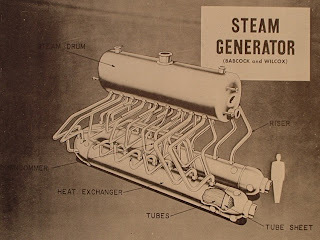 This kind of operation, on a larger scale, had to be performed to make the tube sheets (or, "tube plates") of every steam generator. The large number of penetrations through the plate weakens it; the plates are made extremely thick to compensate. We have mentioned Foster-Wheeler; this company did not stick around in the fabrication of large primary plant components, but did manage to get an order to build the secondary steam generators for the dual-cycle Dresden-1 which was constructed by General Electric. These were vertical U-tube type steam generators, and were in service prior to those at Yankee.. so that these might be considered the first vertical U-tube steam generators in any commercial plant, while those at Yankee Rowe were the first at any commercial PWR plant. Below is one of the Foster-Wheeler steam generators built for Dresden-1. The advantages of having the heat exchanger and the steam/water separation performed inside a single, more compact unit seem obvious, so that there is no need to explain the transition to vertical U-tube steam generators as soon as they were developed. I hope this has been a good, basic introduction to PWR steam generators; now, people everywhere can get a handle on just what is going on inside one of these things, how they're built, and perhaps begin to understand what's being described about San Onofre's primary-secondary leaks. Following is a Nuclear Energy Institute press release from this morning. WASHINGTON, D.C.—The Nuclear Energy Institute tomorrow will launch an advertising campaign that represents a new direction for the nuclear energy industry in advertising execution, message and delivery. “Our goal is to communicate the overriding need to focus on energy and environmental issues that will confront policy leaders in the next decade. Nuclear energy must be part of the portfolio of electric options that fuels economic growth and helps secure energy independence,” said Scott Peterson, NEI’s senior vice president of communications. •electricity industry-leading reliability and at an average production cost (fuel and operations and maintenance expenses) of about two cents per kilowatt-hour. One year after the earthquake, tsunami and ensuing accident at the Fukushima Daiichi power station, public and political support has remained strong for the construction of new nuclear energy plants in the United States. “We have not wavered in our commitment to safety at America’s nuclear energy facilities,” Peterson said. “Along with enhancing that safety, now is the time to have the discussion about the need to begin building new reactors to meet growing electricity demand and protect our air quality. The advertising campaign will focus on policymakers and opinion leaders in the Washington, D.C., region. The campaign was created by NEI’s agency Smith & Harroff Inc. of Alexandria, Va., with animation provided by the Manhattan-based visual effects studio Spontaneous. The first NEI ad spot for air on television is available on YouTube. Click Here. This video is also the featured video at APR's YouTube channel - link in the right margin bar. 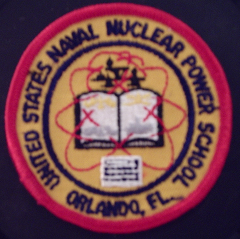 Labels: "nei", "nuclear energy institute"
The 96th weekly installment of the rotating Carnival of Nuclear Energy Bloggers is now up for everyone's review at the American Nuclear Society's "ANS Nuclear Cafe" blog. Click here to get to Carnival no. 96. This feature appears weekly at one or another of the world's top, pro-nuclear blogs and sites. It's the best chance to see newsworthy items of the last week, items that may be of interest to the nuclear industry but which were skipped by large media, corrections to pieces run in large media without consulting the nuclear industry... well, frankly, there are so many types of posts you can find having been submitted by the blog authors that I haven't room to list them all. You get the idea. And to the ANS Nuclear Cafe... I like that Ferris wheel! Labels: "american nuclear society", "carnival"
Today I'd like to announce a very important addition to APR's permanent list of separate or "stand alone" pages, which you can see linked from the right side margin bar. This new page includes all of the content of Appendix III of AEC report WASH-1250; this appendix covers the entire history of public opinion on nuclear energy from inception until the time WASH-1250 was printed in final draft form in July, 1973. This document is, in this author's opinion, of deep and fundamental importance. This AEC treatise is essentially the history - from the AEC's perspective - of the development of anti-nuclear sentiment in the nation. It is highly significant to note how many things mentioned in this treatise still exist, and how some of the predictions made in it came true. I would highly suggest everyone in the nuclear industry who is in a position to communicate with the public give this a thorough read all the way through. Click here to access "Public Attitudes toward Nuclear Energy / WASH-1250"
Remember that this link is always available on the right margin bar of Atomic Power Review. I am developing a supporting page for the content just placed on APR, which will give a great deal of background on, and insight into, the document (Appendix III) itself and make quite a number of parallels to the world we find ourselves in today. Labels: "anti-nuclear", "public attitudes", "wash-1250"
Carnival 95: Fukushima, one year later. Atomic Power Review finds itself hosting the Carnival of Nuclear Bloggers at the time of the first anniversary of the Great East Japan (Tohoku) Earthquake, the resulting tsunami which killed 20,000 people and displaced many more, and finally the Fukushima Daiichi nuclear accident. Recovery from all of these events continues in Japan today, and will continue for decades. A wide array of media coverage is, and has been available on this anniversary. For the part of Atomic Power Review, with its focus on nuclear energy, the best effort to mark this occasion can be found at our Fukushima Daiichi Accident Reports page, wherein links are available to all of the known reports by official government or industry agencies the world over. This link list includes the brand new report by the American Nuclear Society's Special Committee on Fukushima. This rotating feature hosts, each and every week, the work of the world's leading pro-nuclear bloggers and has become a major focus for those who wish to know just what it is that the nuclear industry finds significant. All the top pro-nuclear bloggers either regularly or occasionally submit posts for the Carnival, which is why it's so important for those in the public (and the media) to pay attention to the Carnival, wherever it appears. You can find out what the bloggers are focusing on this week after I show you the following picture and ask you "What is this?" The answer, and more, after the Carnival. Hyperion Power Generation Inc. (HPG), the Department of Energy – Savannah River (DOE-SR), and Savannah River National Laboratory (SRNL) have announced their commitment to deploy a privately-funded first-of-a-kind Hyperion reactor at the DOE Savannah River Site. The United Arab Emirates is expected to place orders for four more nuclear power plants next year beside the four units currently being built by a Korean consortium. China, the world’s biggest energy user, is “very likely” to resume approval of new nuclear projects in 2012 as the government completes a safety review prompted by the Fukushima disaster last year. In "Vermont Yankee and the Public Service Board: The Questions", Meredith Angwin reviewed the aggressive questions that the Vermont Public Service Board (PSB) planned to ask Entergy at the March 9 procedural hearing. On the 9th, Angwin went to the hearing and heard the PSB ask the questions, with extra layers of sarcasm added. She describes the PSB's unprofessional behavior in her post "A Visit to Montpelier and a Crabby Public Service Board." APR note: As to Meredith's "Crabby PSB" post -- a good laugh! But a sobering post. The lesson that the world needs to take away from Fukushima is that it is okay to build hundreds or thousands of new nuclear power stations and to place them quite close to the backyards of millions of people. Sure, the plants are not absolutely safe and may be subject to damage from various events. They will not be manned by perfectly competent individuals who know exactly what to do at all times. However the layers of defense enabled by an incredibly dense energy source are sufficiently robust to ensure that the public will be protected from physical harm no matter what happens to the plant. People living close to the plants have nothing to worry about. In the past year the U.S. Nuclear Regulatory Commission has pushed back the schedules for two early site permits and two combined license applications, but there hasn't been so much as a peep of protest from the affected utilities. The agency's rationale is that none of the related plans, and schedules, for new nuclear reactors are concrete enough to justify a squawk. The agency is right: plunging natural gas prices have prompted those utilities—PSEG, Exelon, Luminant and NextEra—to reevaluate the timelines for their new build ambitions. Meanwhile the NRC is using the reprieve to focus on an ambitious new Fukushima-related regulatory agenda; agency resources that would have been otherwise slated for staff work on the four new build cases are now being used to impose new safety requirements on the nation's 104 operating nuclear reactors. Gail Marcus at Nuke Power Talk looks at what has happened in the year since the Fukushima accident and what it might mean for the future of nuclear power. While there has been a lot said on all sides of the issue, on balance, she sees a fairly positive picture emerging in terms of public acceptance, media coverage, national decisions (with a few exceptions), and plans for upgrades of current plants and for new reactors in the future. Gail Marcus discusses the report of the American Nuclear Society on Fukushima and the actions of the U.S. utilities to implement post-Fukushima upgrades to existing plants. She sees in both actions evidence that these organizations are stepping up to their respective responsibilities. "Can we repeat facts about Fukushima often enough to overcome fears?" activists. Complete with a lively and informative discussion thread. to their interim reports where available. APR note: Thanks to Paul Bowersox for the submissions. These two posts are great for their timeliness and content.. and also happen to be written by two of my friends! That does it for this week's submissions to the Carnival. Readers are advised to dig through the link list on APR, and to watch the auto-update blog roll in the right margin (as well as the Twitter box) for what will probably be many further Fukushima-related pieces at this one year point. Now, as to "what WAS that thing?.." "The 65-ton reactor vessel for the Hallam Nuclear Power Facility is lowered into place at the 75,000 kilowatt nuclear plant near Hallam, Nebraska. 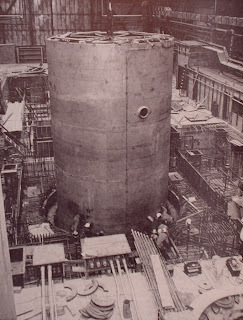 Nineteen feet in diameter and 33 feet high, the vessel will contain the reactor core and its pool of liquid sodium." According to a visitor's brochure in the APRA collection, this vessel was manufactured of 304 stainless steel and was up to 2 inches thick. (Sodium cooled plants used much lower pressures than PWR or BWR plants, and so had thinner vessels.) The reactor was a graphite moderated, sodium cooled 254 MWt type based on experience with the SRE plant in California. The entire reactor assembly was actually below grade in the facility. Let's examine a few further illustrations. Above is the cover of the brochure covering this plant. 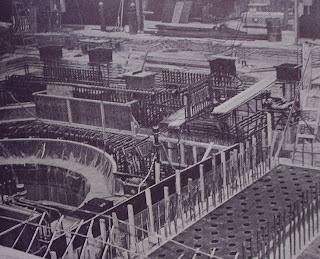 The entire power station is properly known as Sheldon Station; the station comprised a coal fired boiler at the far end from us in this shot (supplied by Babcock & Wilcox), a central turbine area for the turbine generator, and on this end the Hallam Nuclear Power Facility, or HNPF. The HNPF was mostly funded by the AEC, who contributed $51.25 million of the total $57 million cost; the entire $20 million cost of the conventional plant was funded by Consumers Public Power District or CPPD (who made up the rest of the HNPF cost.) The entire plant then provided power to the CPPD grid. 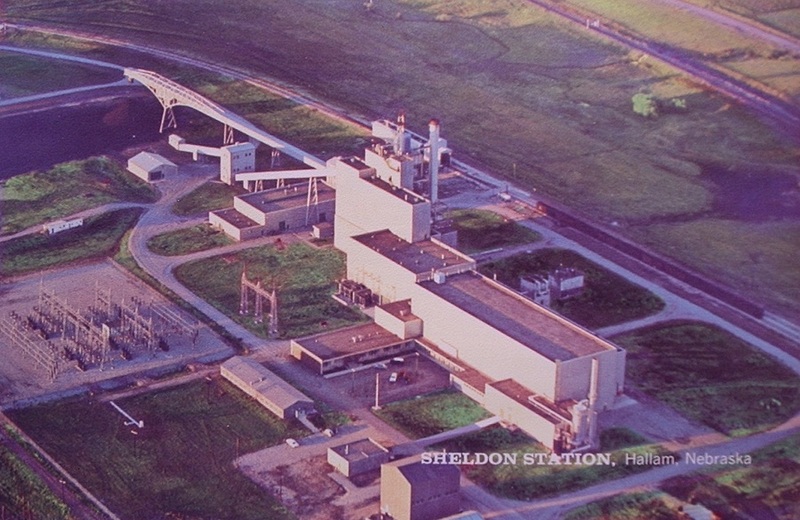 Groundbreaking for Sheldon Station took place in June, 1958, according to the brochure; the conventional facility (coal fired) went on line in May, 1961. 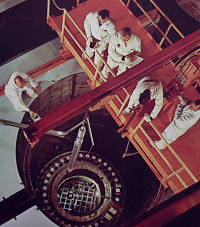 First criticality of the HNPF reactor took place in 1962. The reactor vendor for the HNPF was Atomics International; the architect-engineer firm for the HNPF was Bechtel Corporation. Peter Kiewit Sons, Inc. was the overall manager for site construction at HNPF. "This is the core cavity liner (center background) for the reactor vessel. Built of sections of half-inch thick steel, the liner is 46 feet high, 24 feet wide and 34 feet long. Note that it is all below ground level." 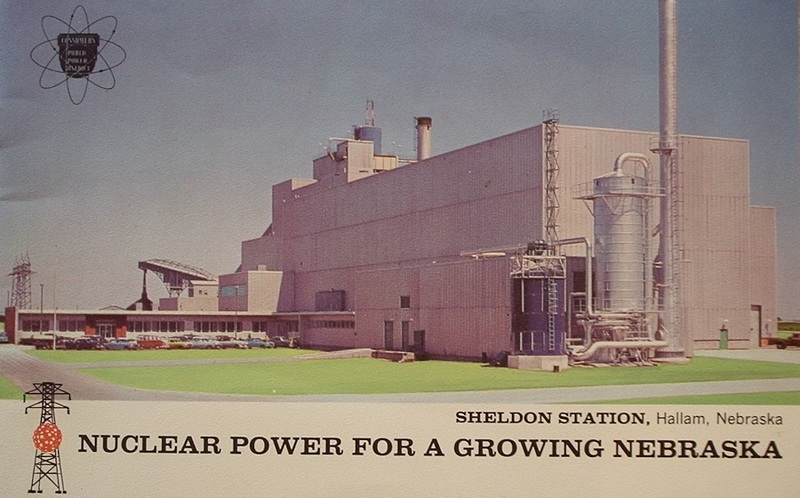 --from the Sheldon Station brochure. The core cavity liner was surrounded on its outside by concrete. Inside of this was a layer of thermal insulation, then the outer steel tank, thermal shields, and inside of that the reactor vessel. 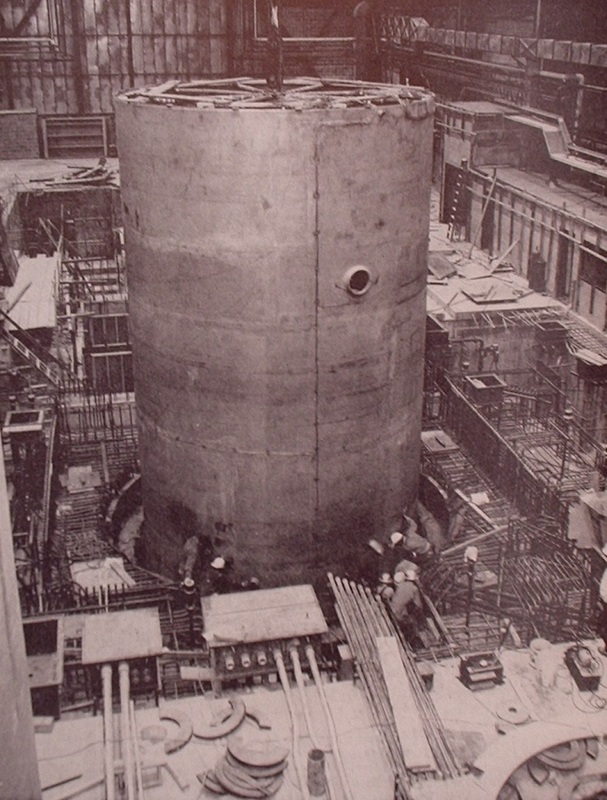 The reactor vessel, the containment tank, and other heavy primary components were manufactured by Baldwin-Lima-Hamilton Corporation at Philadelphia, Pennsylvania and shipped by barge to near the site. Below is a three panel illustration from the brochure showing these components on the barge, then being offloaded on special trucks. The route for these from Philadephia was South to the Gulf of Mexico, then up the Missouri River. 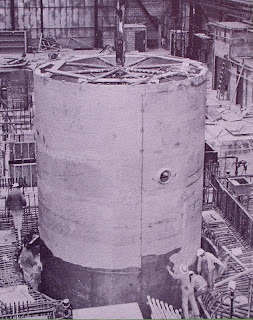 Below, we see another different view of the reactor vessel being lowered into the cavity liner. The vessel has been lowered further in this view than it was in the original shot at the top of this post. 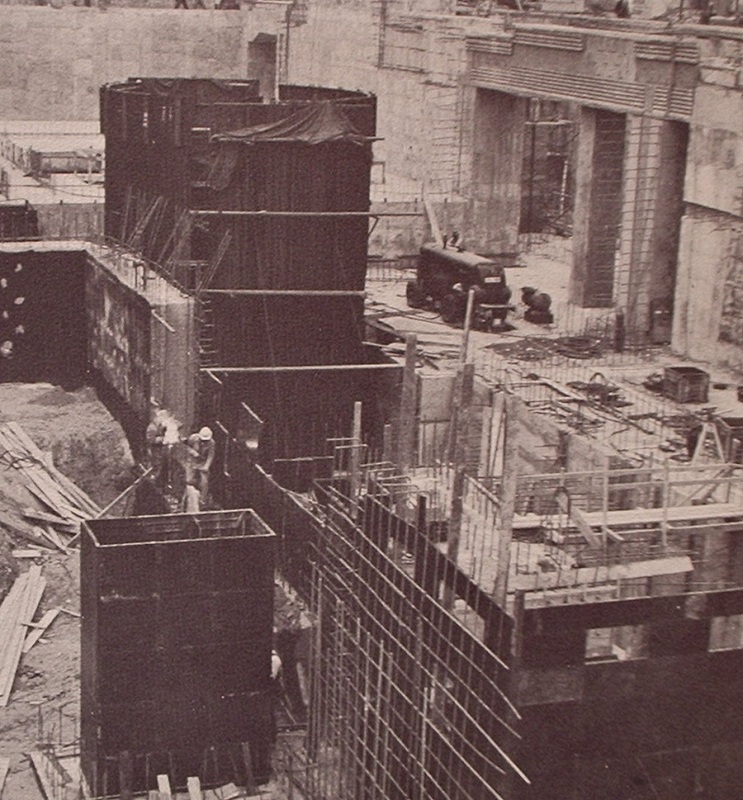 Below, a later shot with the following caption: "Construction of the nuclear facility was moving into its final stages as this picture was taken. 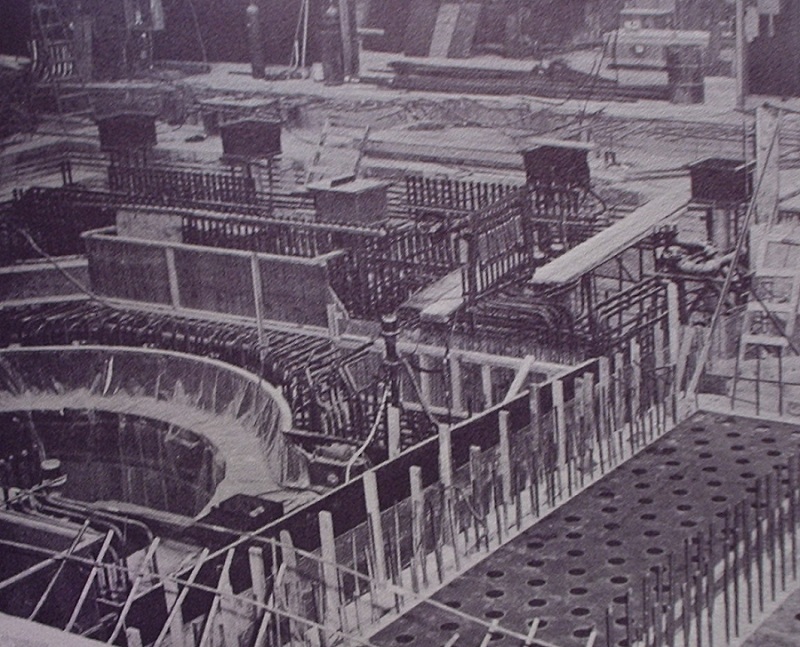 The reactor vessel is shown at the left; the steel plates for the fuel storage cells at the right." Finally, we see a shot of the station complete, from the rear cover of the brochure. The HNPF is the large rectangular building nearest the right of the photo; next is the turbine building. Jutting out from the side of the station is the combined control and office facility. Furthest away with the large smoke stack and associated coal conveyor is the conventionally fired portion of the plant. 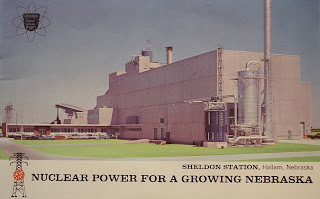 Today, Sheldon Station remains but the nuclear facility has been in SAFSTOR for many years, razed to the level of the interior floor and buried under feet of earth. Click here to read about Sheldon Station and its history at the Nebraska Public Power District's website. Since this feature began showing a reactor vessel, CLICK HERE to learn a lot more about reactor vessels in general at APR. That's all for this Carnival. The Carnival will next appear at Atomic Power Review in April - and that will be the 100th Carnival of Nuclear Bloggers. You'll want to check that one out for some very special features. Labels: "carnival", "hallam", "HNPF", "sheldon station"
I have received a number of comments on the information I've provided over time on reactor pressure vessels and have also received requests for further information. 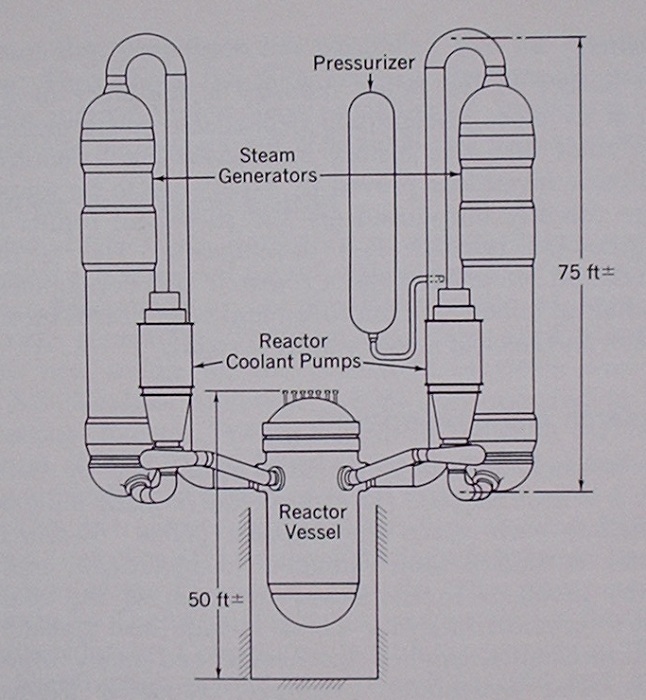 As a result of this input, I've prepared the following brief discussion on reactor vessels. A few brief points will begin this presentation. 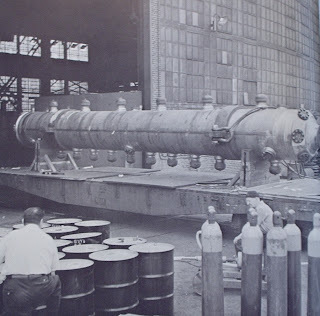 Let's start off with an examination of the reactor vessel manufactured for the first large commercial nuclear plant in the United States - the Shippingport Atomic Power Station. Below is an illustration - click to enlarge. 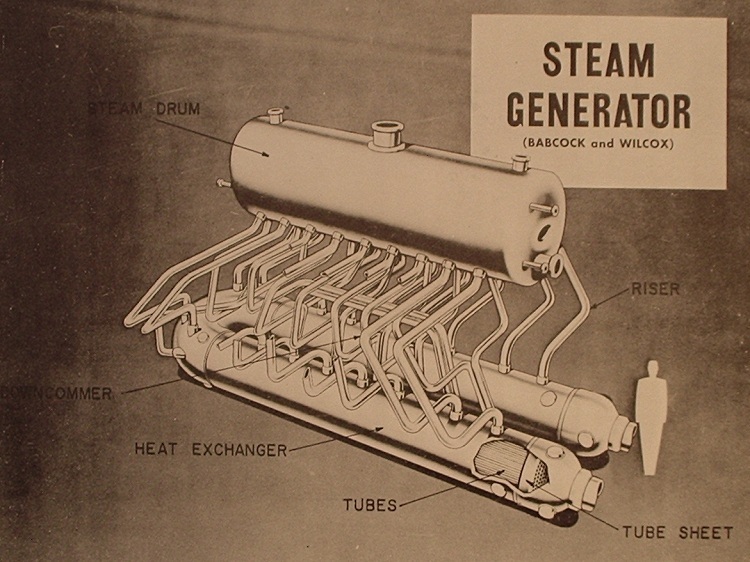 This illustration is taken from a complete Westinghouse-AEC-Duquesne Light Company press release package that was released prior to the dedication of the Shippingport plant (which took place in May, 1958). The details are clearly marked. 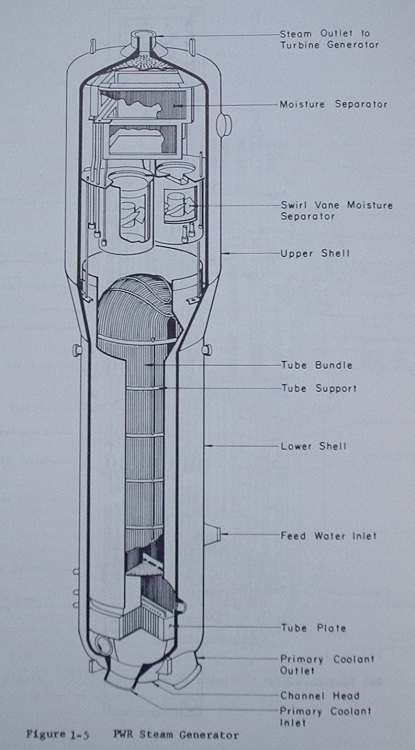 Viewed simply, the vessel has a cylindrical body section, to which on the bottom is welded a hemispherical lower head. 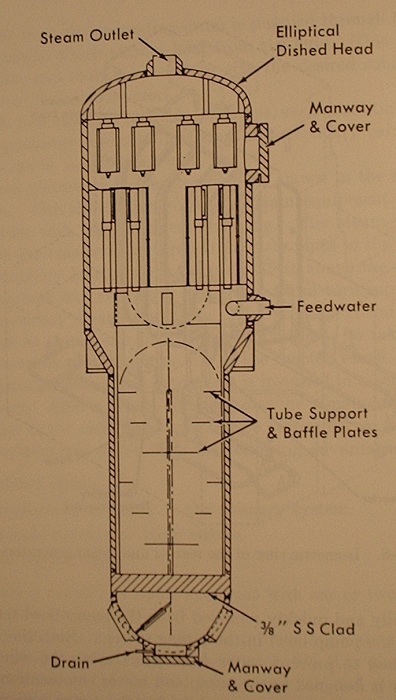 The upper head must be removable to allow for refueling or other work inside the reactor vessel; thus, it is bolted to the rest of the reactor vessel. Penetrations for entry of the control rod extensions and instrumentation are obvious. The vessel was roughly 32 feet 6 inches high, 10 feet 6 inches in diameter. The internal height was 375 inches (31 feet 3 inches) and the internal diameter was 109 inches (9 feet 1 inch.) The nominal thickness of the barrel section or wall was 8-3/8 inches. "The vessel is formed of manganese-molybdenum carbon steel plates and forgings (ASTM-SA-302, Grade B) with a 1/4 inch stainless steel (AISI type 304-L) cladding. The 302 material was selected because it was the highest strength carbon steel allowed by code. The weight of the complete vessel, including the closure head and thermal shields, is approximately 264 tons. "The vessel shell and the bottom hemispherical head were made from plates to which the stainless steel cladding had been roll bonded. These were the thickest clad plates ever roll bonded in the United States." "The shell (cylindrical body) is a right circular cylinder formed of three cylindrical courses joined by circumferential welds. Each course, in turn, is made of two semicircular plates joined by longitudinal welds. The longitudinal welds in the three courses were oriented 90 degrees from each other to avoid possible crack propagation." The text continues to indicate that on the top of this cylinder was welded a forged bolting flange (to bolt down the closure head) and that to the bottom was added the lower head, again by welding. The lower head was made from four pie-shaped plates and a central dished or domed section, all welded. The nominal thickness of the lower head is given as 6.2 inches. We can see that the fabrication of even this first vessel challenged the industry- and vessels didn't get smaller after this but rather got much larger. 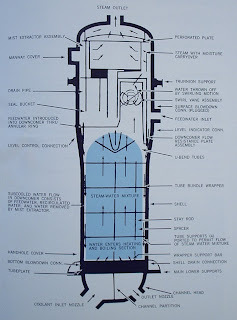 Before this though let's take a look at a couple of other very early design reactor vessels. 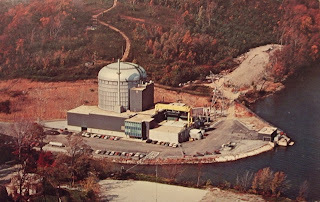 Below is the vessel from the nuclear plant built by Babcock & Wilcox for the N.S. Savannah. The illustration is from a book of official specifications for the entire powerplant. This vessel was fabricated from ASTM A-212 Grade B carbon steel, was clad internally with Type 304 stainless steel. Looking at the illustration (click to enlarge) we see that there are indications for where welds have taken place, seen in the vessel wall and in the head as black wedge shapes. So, we can see that the closure head has a domed section with the bolting flange welded on. We can see that there is a bolting flange welded to the body of the vessel; the body is made up of two cylindrical sections welded atop each other, with a lower vessel head welded on. 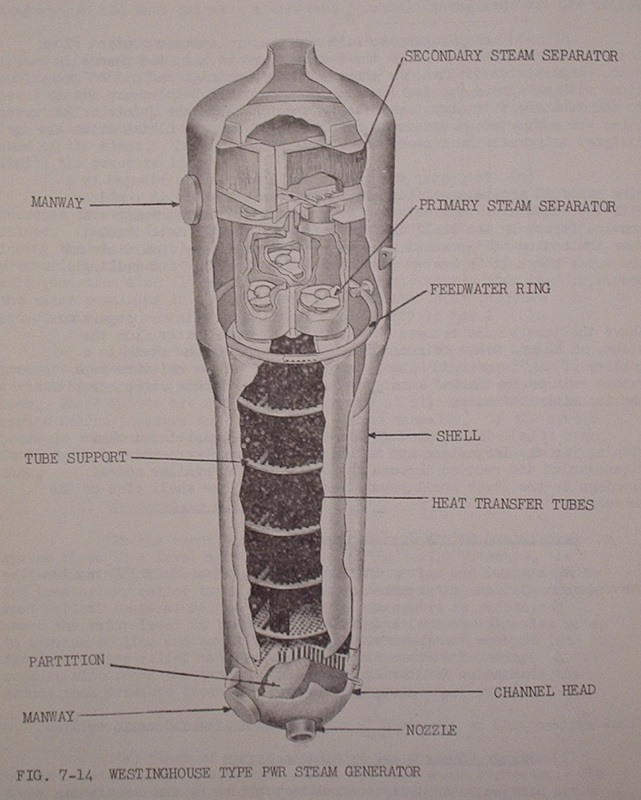 As with the Shippingport reactor vessel, coolant enters at the bottom of the vessel and exits much nearer the top. 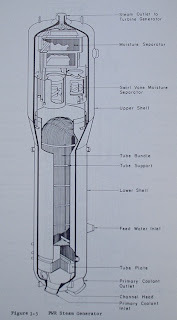 However, note that the Savannah's core was what we call a "two pass" core; coolant passed up around the core basket, down through half of the fuel elements, back up through the other half and then exited the vessel through the outlet nozzles. 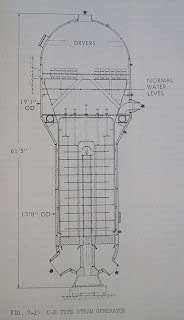 This vessel for the Savannah had two inlet nozzles and two outlets; the Shippingport vessel had four inlets and four outlets because it was a four loop plant. 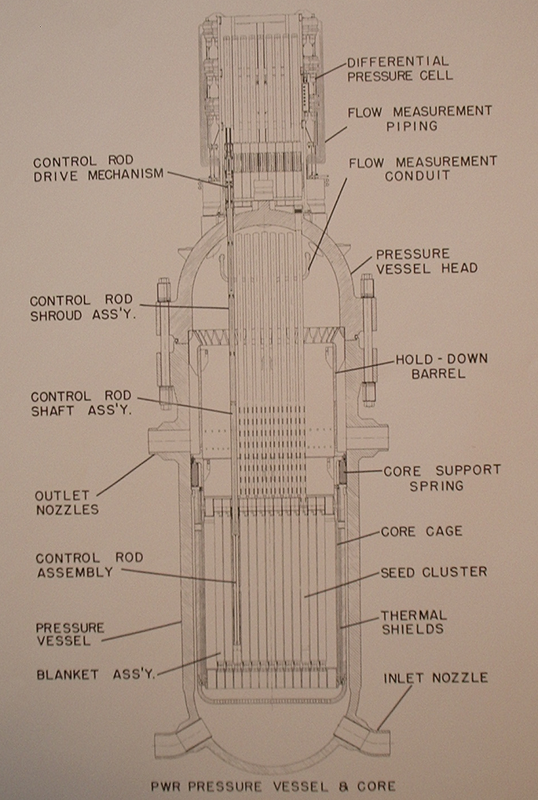 Only a few very early reactors had coolant entry at the bottom; breakage of a pipe would surely mean draining of the core rapidly. Later vessels had all the pipe penetrations for coolant above the height of the core. Knowing this fact makes it easy to spot very early reactor vessels in random photos. Just for comparison, let's take a look at the reactor vessel at Indian Point 1. 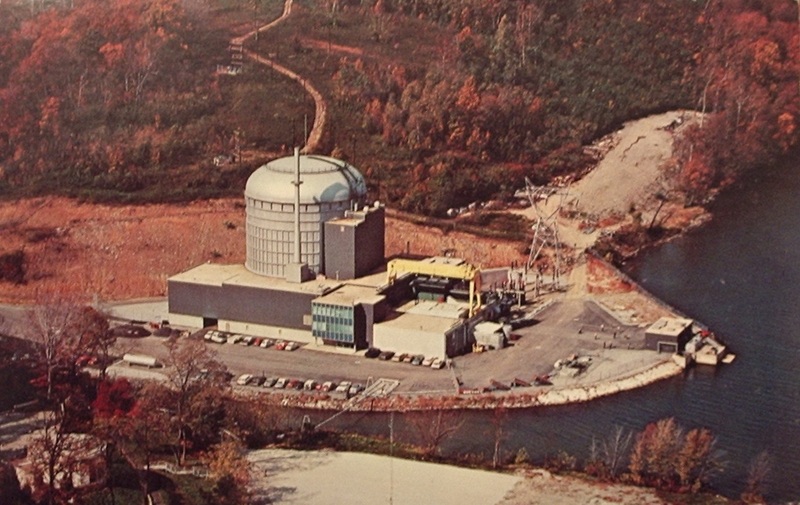 That plant, and the plant for the Savannah, were Babcock & Wilcox's first two commercial nuclear plants. This is an unusual vessel. 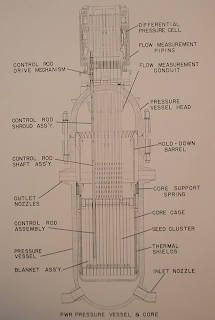 Most pressurized water reactors have top entry control rods, but Indian Point 1 had bottom entry. We see, starting at the bottom then, the lower large radius hemispherical head. There are then three cylindrical body sections atop each other; above this is a nozzle ring section, an intermediate top ring and then the bolting flange. The vessel head is bolted down onto this and like the head we saw earlier has a bolting flange section and a domed head. Let's take a look at some fabrication illustrations before we get into the metallurgical specifics of early vessels. Above, an illustration provided by US Steel for the 1958 Geneva Conference photo book developed for the US AEC, titled "Atoms For Peace - USA 1958." This shows what is described as a three foot thick pressure vessel closure head forged by US Steel for a pressurized water reactor. This fascinating illustration shows a bolting flange in the process of manufacture at US Steel prior to being drilled or welded to the vessel. This illustration is from the May 1959 issue of NUCLEONICS and is part of a US Steel ad. 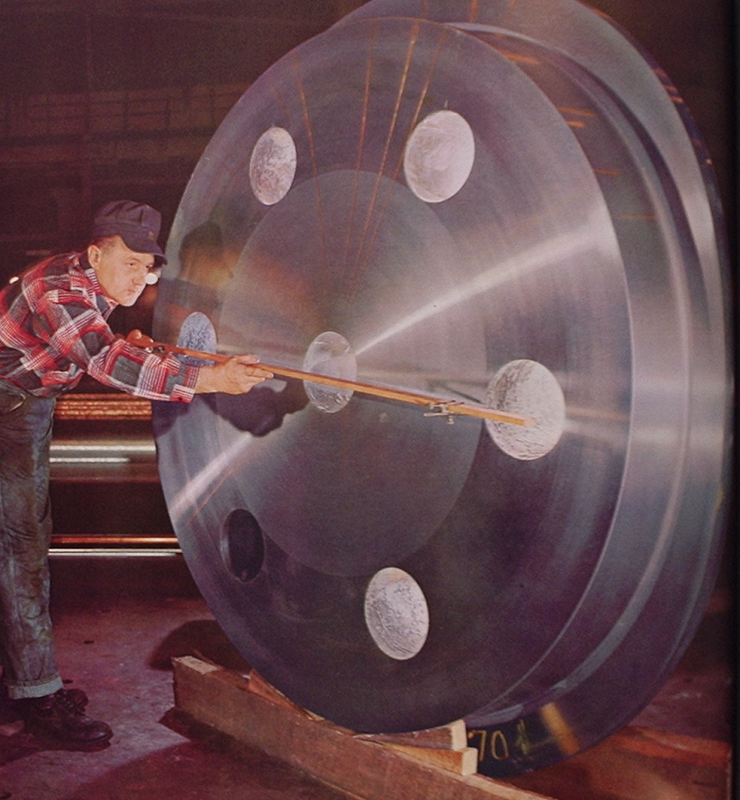 There are two parts shown, the bolting flange and a head; the bolting flange weighed 74,000 lbs and the "top disc" or closure head forging seen at top right weighed 36,750 lbs. These parts were forged, then underwent preliminary heat treating and preliminary machining, according to the ad. Following this was quenching and tempering, then ultrasonic inspection, tangential tensile tests, Charpy V-notch impact tests, bend tests and finally magnetic particle inspection. 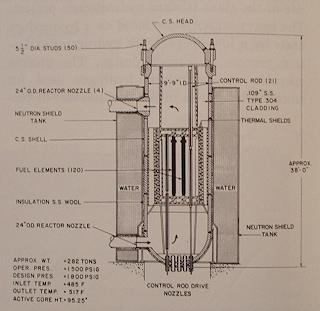 The parts would then be passed along for further machining and eventually fabrication into a complete reactor vessel. 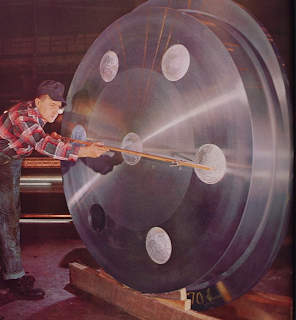 The illustration was made at US Steel's Homestead Plant. ASTM A 212-B. Composition, Wt. % Max: Carbon .35, Manganese .90, Phosphorus .04, Sulfur .05, Silicon .30, Molybdenum 0. ASTM A 302-B. Composition, Wt. % Max: Carbon .25, Manganese 1.5, Phosphorus .04, Sulfur .05, Silicon .32, Molybdenum .6. 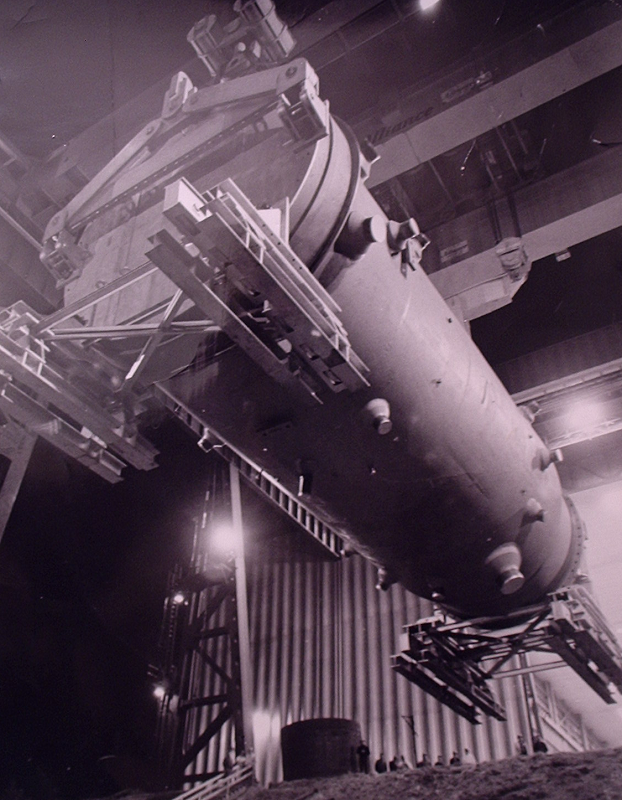 Dresden 1 used an A 302 carbon steel vessel, clad with 304-L stainless steel; wall thickness was 5-5/8 inches with 3/8 inch cladding additional. Pathfinder used an SA 212 carbon steel vessel, 'stainless lined,' with a wall thickness of 3 inches. From an official brochure covering construction of Connecticut Yankee (Westinghouse PWR) which was ordered in December, 1962 we find that this plant's reactor vessel was SA-302 Grade B with a 10-25/32 inch wall thickness, clad internally with 5/32 inch of 308 and 309 stainless steel. This vessel was 41 feet 6 inches high, and weighed 915,000 lbs dry. This plant's thermal output was 1825 MWt. A508 ASTM Specification for Quenched and Tempered Vacuum-Treated Carbon and Alloy Steel Forgings for Pressure Vessels. According to ASTM STP 819 (quoted frequently on this site) "supplemental specifications for A533-B and A508 Class 2 and Class 3 steels limit the maximum copper content to .1% (heat analysis) and the maximum phosphorus content to .012% for best radiation resistance." This is the low-copper alloy change I mentioned in the second Palisades post on this site. We find in the volume "Toward Improved Ductility and Toughness" (1971, also often quoted on this site) this significant quote concerning the variance of ductility transition temperature with accumulating neutron exposure (for you nuclear types, this is included under 'Increase in Charpy-V 5.2kgm/sq. cm transition temperature as compared to neutron exposure at 288C (neutrons over 1 MeV): "Metallurgical factors may contribute to the observed variance, but variation in composition of residual elements appears to be the dominant cause of the large observed variation in the sensitivity of steels to irradiation embrittlement." A533 Type B Class 1: Carbon .19, Sulfur .20, Phosphorus .008, Silicon .27, Manganese 1.35, Nickel .56, Chromium 0, Molybdenum .55, Copper .07, Cobalt 0, Vanadium 0. A508 Class 3: Carbon .16, Sulfur .009, Phosphorus .008, Silicon .18, Manganese 1.265, Nickel .68, Chromium .23, Molybdenum .485, Copper .05, Cobalt .01, Vanadium <.005. We can further briefly compare Westinghouse's official specifications for reactor pressure vessels from 1971 and from the middle 1980's to see the alteration in material including the post-1972 low-copper supplemental specifications as shown below. All surfaces in coolant contact clad with 300 series stainless or with Inconel. By this time the reactor vessels have become quite large and heavy indeed, especially for the largest offerings from each of the makers. Below is a picture of a very large boiling water reactor vessel being moved out of Babcock & Wilcox's Mount Vernon, Indiana plant. 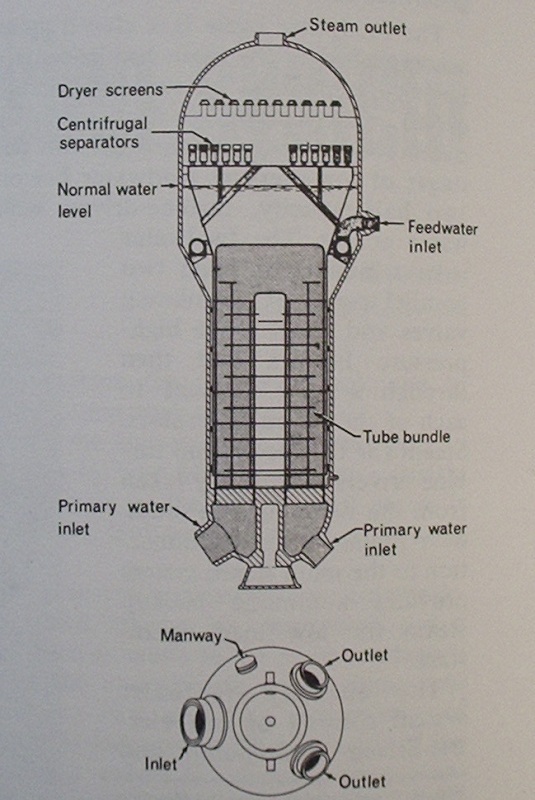 This is a 1969 illustration of the vessel for Dresden-2. The vessel weighed over one and a half million pounds and was the largest yet built at the time. 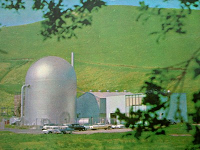 The largest range of reactor plants built in the US has been roughly 3400 MWt and around 1100-1200 MWe; we can examine comparative size particulars for vessels from a theoretical study conducted for the NRC in 1977 by United Engineers and Constructors and whose results are contained in reports NUREG-0241 and NUREG-0242. Over time, it has been realized that not only are metallurgical considerations of importance, but conditions of fabrication as well. 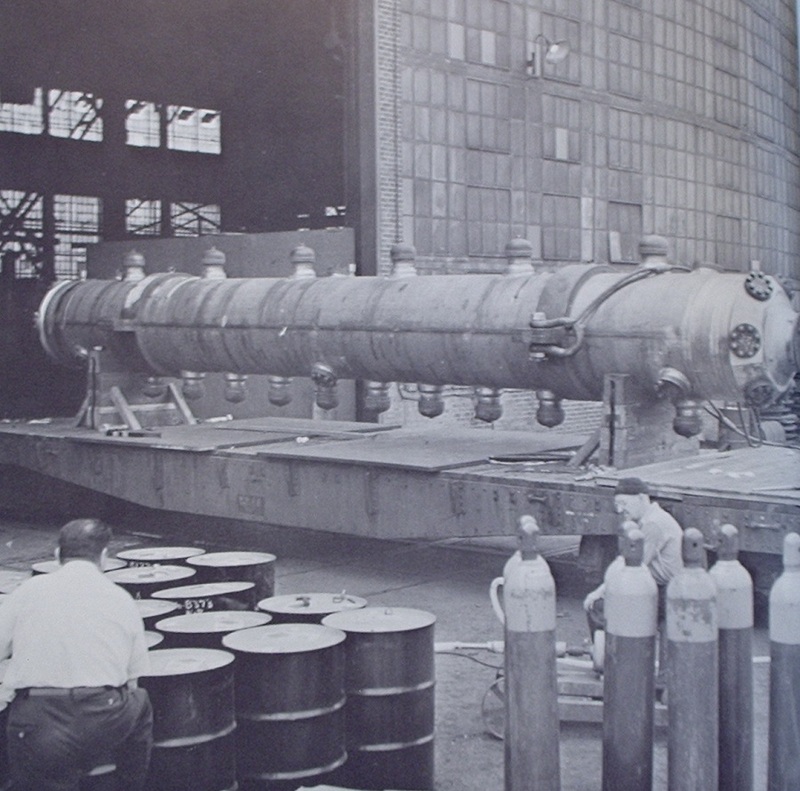 We saw very early on that at Shippingport, the vertical welds on the cylindrical sections were deliberately unmatched when the sections were stacked. In point of fact, vertical welds such as these are problematical at best so that the number of them should be reduced to a minimum. 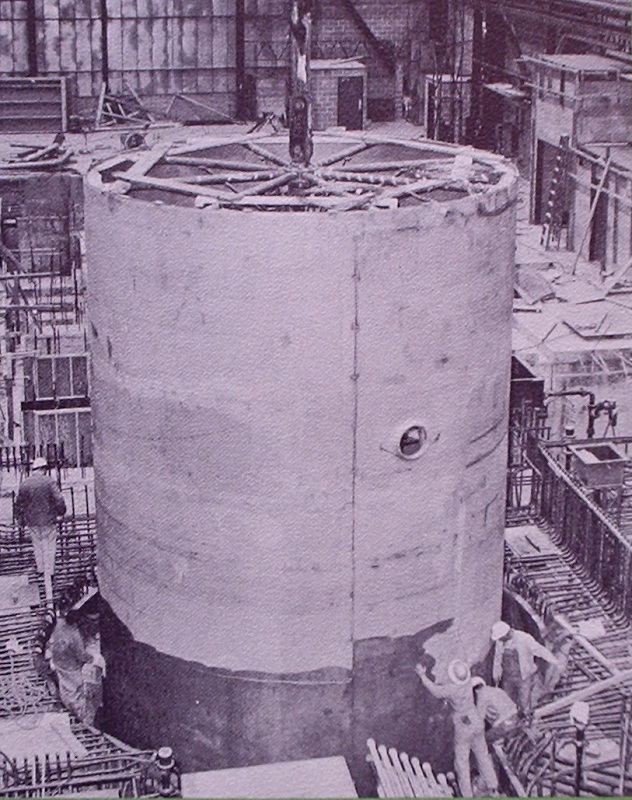 Interesting in light of this was the long standing Babcock & Wilcox practice of manufacturing entire reactor vessel body sections out of a single, gigantic plate which was rolled into a cylinder and then welded right up the side continuously in one pass without stopping by use of a process known as electroslag welding. This ensured that while there would be an axial weld in a region of high exposure, there were not separate circumferential welds. Other manufacturers elsewhere in the world began to use only forgings stacked up to make vessels - but this then incorporates many circumferential welds in the vessel body. Each maker world wide has employed his own methods in making reactor vessels and many have developed proprietary specialty processes. In your piece it might be good to once again dispel this "40-year design life" canard. There is no "40-year design life". When the first nuclear plants were designed and being planned it was recognized that they would likely operate significantly beyond the 40-year timeline imposed by the economic (not technical) requirement for retiring the debt on the construction bonds that were issued. Since 40 years was what the bond issuers used for fossil plants, the same timeline was assumed for nuclear units. As long as the systems are maintained properly and updated as technology evolves, there is no reason why 40 years should be the limit. In reference to how some people are using a 40 year life limit on plants and connecting this to reactor pressure vessel embrittlement, this last statement by Joseph Talnagi might be the most significant statement of this entire article. Here is one final illustration - and it's a look back in time. 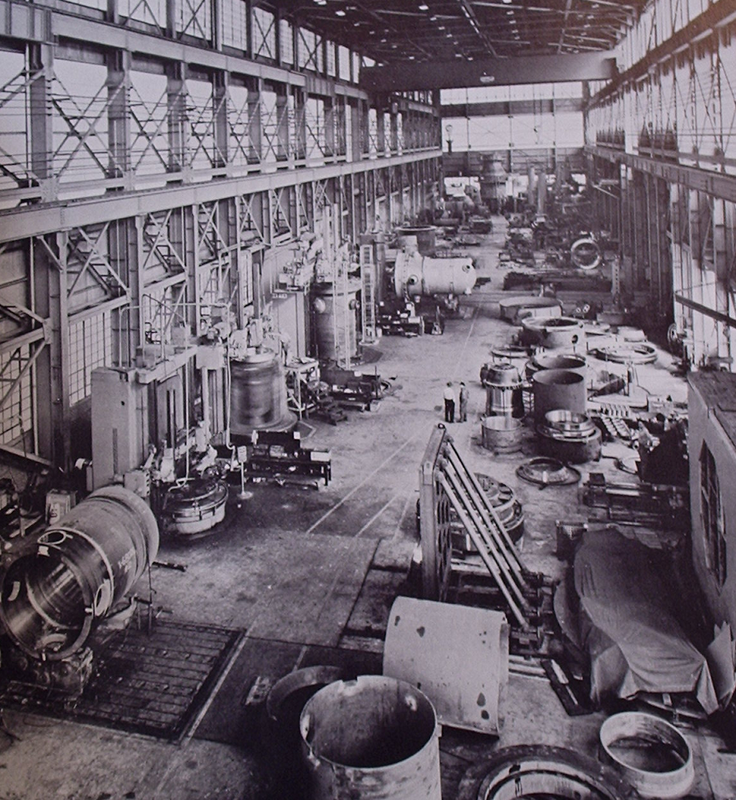 This is an illustration from "Atoms For Peace - USA 1958" and shows Combustion Engineering's reactor component shop in Chattanooga, Tennessee in late 1957 or early 1958. We can tell this is an old photo because the vessel assembly in the background has inlet penetrations in its bottom vessel head. Further, later large vessels made at this facility fully occupied the entire width! At lower left we see core barrel and core cage assemblies in progress. A blurred core barrel on a rotary machining fixture (turntable) is visible along the left wall, with more components used in machining and awaiting machining occupying the center of the shop. I have much more information on reactor vessels, should the need arise. I do believe that this piece, coupled with the two recent Palisades pieces and the older Genkai piece should solidly cover all the basics of reactor pressure vessels in terms of embrittlement, and an introduction to metallurgy and fabrication. Labels: "alloy", "embrittlement", "fabrication", "pressure vessel", "steel"
NEI is hosting a blockbuster-sized Carnival of Nuclear Bloggers at its NEI NUCLEAR NOTES blog today. This is one of the weightiest (if that is a word) Carnivals yet - so I'd highly suggest everyone get right over there and start reading in order to get a handle on the most significant, the most interesting and the most timely issues addressed by the pro-nuclear blogging world. As we all probably expected, the NRC hearing on Palisades went off last night with the NRC assuring the attendees that while there are significant personnel related (and that really means procedural, or else "safety culture") issues and opportunities at Palisades the plant is safe to operate. The NRC assured everyone that if Palisades were not safe, it would not be on line. Click here for a brief locally written roundup on the NRC hearing. In relation to my previous post on Palisades and the issue of pressure vessel embrittlement and the threat of PTS or Pressurized Thermal Shock, I received today a fascinating e-mail from A. David Rossin, a former President of the American Nuclear Society who actually was at work for around a decade at Argonne National Laboratory studying the neutron embrittlement of reactor pressure vessels. Dave tells us that back at that the issue of PTS only seriously first came up toward the end of the 70's. He says that some of the very earliest theoretical data (and this has to be from the 50's or 60's I would guess) was proven inaccurate in its assumptions, so that he and a number of other people really got the ball rolling on new research. When the research was in full swing a number of the major national laboratories involved in nuclear energy research were involved, including Oak Ridge and the Naval Research Laboratory among many others. Still, with only a few large computers in the country at that time, highly complex and involved calculations were not easy - and the limited time that any of the computers was available for a specific job didn't make things any easier. Later on, in the early 1980's (as I mentioned in my previous post) a new wave of work began to more closely estimate the real effects of neutron damage to pressure vessels far more accurately than before - and Dave was in on this again. (It is important to note that until then, and in fact until now in 2012, no reactor pressure vessel - no matter how old - has ever failed in a brittle fracture mode, nor has any failed in a PTS environment.) What Dave relates as the end of this span of serious research was a very conservative rule set by the NRC that satisfied everyone in terms of protection against embrittlement damage and failure. 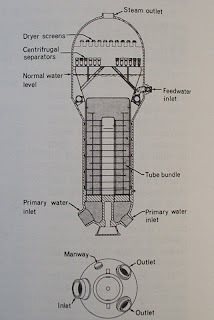 Also, according to Dave, and very interestingly, there was evidence that the actual service these reactor vessels were performing was actually essentially annealing them while in service; that is to say, the heat was high enough that the vessels self-annealed and essentially removed the damage. Most of the new research stopped around 1985 as a result of this discovery and the NRC's conservative approach. The fact that no vessel had still ever failed at that time gave weight to the safety of the assumptions at that point - but irradiation samples continued to be used and tested, and continue to be all the way through, non-stop, until today. 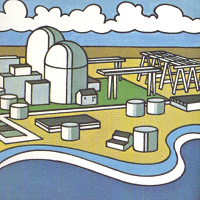 Above, artwork showing a pre-completion artist's conception of the Palisades Nuclear Plant. Artwork produced by Combustion Engineering and included in AEC publication WASH-1082, "Current Status & Future Technical & Economic Potential of Light Water Reactors," March, 1968. Now, when we discuss embrittlement of reactor vessels what we are talking about is a slow alteration of the material's physical qualities, such that the material would behave in a more brittle (likely to shear along crystalline lines) and a less ductile (likely to exhibit a rough tearing effect) type of failure when stress is applied which is high enough to cause the material to fail. More important though is the fact that the temperature at which the material transitions from a ductile material to a brittle material continues to go up as the material is exposed to radiation - in this case, neutrons. I mentioned in the previous post that the over-simplification that neutrons are blowing holes in the metal is too simple. At low energies, neutrons might displace one or two atoms at most. At higher energies, they might displace more - and at really high energies, they might cause a scattering effect that displaces an equivalent to perhaps several thousand times the volume of one atom. But as Dave has now told us, this damage can be removed by the annealing effect of the heat that the vessel is exposed to in normal operation. Annealing as a deliberate method - in other words, removing the reactor core and internals and artificially applying heat from, say, an electric source - has only ever to my knowledge been performed once on an actual reactor vessel in service (SM-1A, a small PWR at Fort Greely, Alaska which was contracted to Peter Kiewit & Sons who subcontracted the reactor to ALCO Products, Inc.) although the West Germans did construct an entire apparatus for use in 600 MW pressurized water plants; their research showed that (for the specific metallurgy of the vessels in question) an application of 450C for 60 hours would recover the damage from neutron embrittlement. 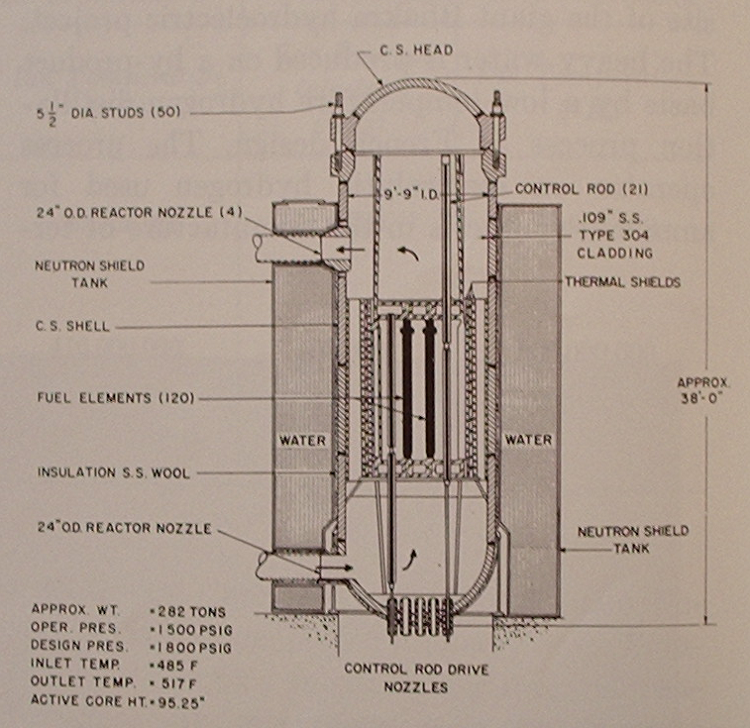 According to ASTM STP 819 the effort required to anneal even the small pressure vessel of SM-1A was considerable from an engineering standpoint. There are many other things that could be done - and sometimes, nothing is required if testing shows that a vessel can still safely operate in its previous operational limits. The above are merely a few suggestions from several sources consulted here. What is most important for the outsider to understand is that an incredible amount of effort has actually been devoted to the study of neutron damage to reactor materials for half a century, and that standards have NOT relaxed; rather, research and many kinds of testing of actual reactor materials have shown both that by and large the original conservative metallurgical assumptions have proven highly protective, and that modification of operational limits and/or core arrangement and material can extend reactor vessel life far beyond that originally conceived. This is one case where design from decades ago has held up in intensive service. Thanks to A. David Rossin for his wonderful input and experience. Labels: "annealing", "embrittlement", "palisades", "pressurized thermal shock", "PTS"